Well ladies and gentlemen, the Cornetto trilogy has finally come to a close. Whether you knew it or not, director Edgar Wright and writer/actor/producer Simon Pegg teamed up in 2004 to create the most loosely connected cinematic trilogy of all time beginning with Shaun of the Dead, followed by Hot Fuzz in 2007, and culminating in 2013 with The World’s End. The films share no characters, plot devices, settings, or really any foreseeable connective quality. What they do share is actors Simon Pegg and Nick Frost, passing references to a popular British ice cream treat called Cornetto, and a few surprises for die-hard fans. Otherwise, these three films are as unrelated as could be. What we’re left with is a social commentary wrapped up in an inside joke that unfortunately has no solid punch line. The World’s End follows Peter, Andy, Oliver (also known as ‘Oman’ because of an unfortunate birthmark shaped like a 6 on his forehead), and ringleader Gary. 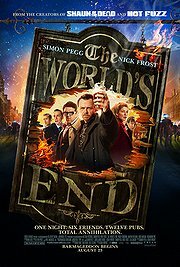 In 1990, Gary (Simon Pegg) and his four best friends attempted and failed to complete “The Golden Mile,” a 12 tavern pub crawl in their hometown of Newton Haven that ends at a particular pub named The World’s End. Twenty years later, Gary’s life has paled in comparison to that fabled night two decades ago, and while he has not quite left the wild days of his youth behind, his friends have. After recounting his happier days at a rehab session, Gary decides to reconnect with his reluctant friends and convince them to give “the Golden Mile” one more go. The World’s End does very well moving from point A to point B providing lively introductions to the characters and Hangover-style laughs as the group of friends reminisce over past antics and attempt to reclaim the passion of their youth. Pegg’s performance as Gary is uproarious and sharp. His reaction to Andy (Nick Frost) ordering a tap water rather than a proper pint is comic perfection, and his various monologues are quick witted, fast, and smart. Unfortunately, the film hits a stumble moving from point B to point C and does a world class face plant on its way to point D.
I want to preface this next point by saying that I do not think From Dusk Til Dawn is a good film, nor do I feel that The World’s End is a bad film, yet a comparison must be made. From Dusk Til Dawn, the George Cloony/Quentin Tarantino vampire western, is notoriously critiqued in the following way: “It was pretty good until the vampires showed up.” The World’s End will likely receive similar word of mouth, except replace “vampires” with “alien robots.” The movie does not come entirely off the rails upon the revelation of alien robots, but the tone becomes uneven and “ludicrous” becomes a word that might be used to describe the events from that point forward. Proponents of the film will cite Shaun of the Dead as a film that similarly injects a sudden influx of horror into an otherwise silly comedy. 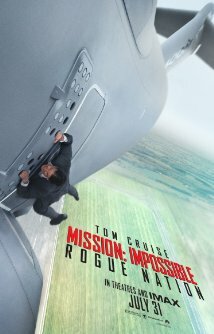 However, the mixing of genres in that film works far better than in this one. The “body snatching” alien storyline interrupts all of the progress made in the film’s first half and unfortunately leads to an incredibly unsatisfying conclusion.